The Sallustian Obelisk is 45.6 feet tall (99.9 feet with base). 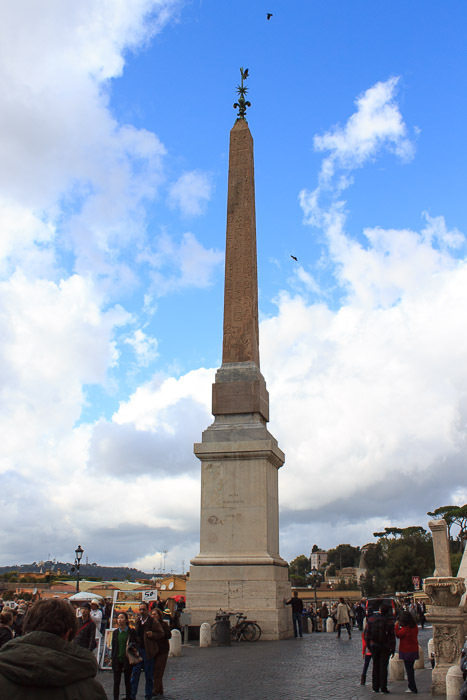 It is a Roman copy, although smaller, of the Flaminian Obelisk of Ramses II, now in Piazza del Popolo. 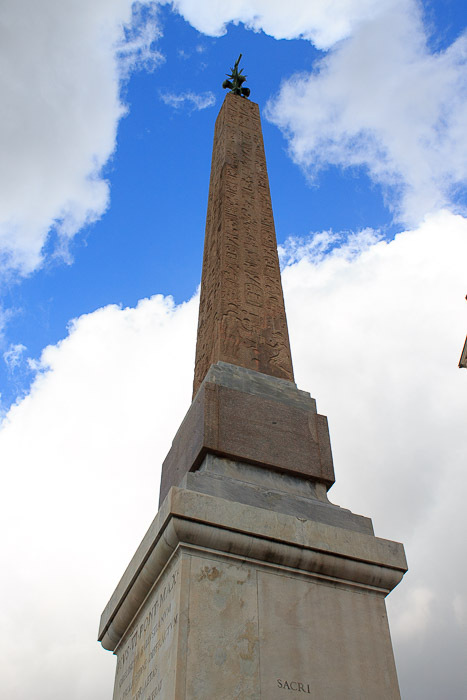 The hieroglyphics of the Flaminian Obelisk were copied onto this obelisk. Its construction in Rome was ordered by Aurelius and it was initially erected in a private residence called Horti Sallustiani after the name of its first owner, the Latin historian Sallustius, a very wealthy man. The Horti Sallustiani covered a large area near Porta Pinciana and Porta Salara, which later became part of Villa Ludovisi. According to experts on ancient Egypt, some of the hieroglyphics on this obelisk are upside down, as they were copied by ancient Roman workmen from the newly arrived obelisk of Ramses II while that object was still lying horizontal on the ground. In the fifteenth century the obelisk was lying on the ground near its base, broken into two pieces, and it remained there until 1733 when Clement XII moved it to the Piazza di San Giovanni in Laterano in 1734, but kept horizontal. He left the original base of the obelisk where it was and had it covered over with dirt. It was moved by Pius VI in 1789 to its current location at the top of the Spanish Steps and erected there. The original base was found again in 1843 in the northern part of the horti, between the Vie Sicilia, Sardegna, Toscana and Abruzzi. It is a large block of red granite (8 by 8 feet), and has been placed on the Capitoline Hill as the base of a monument to the fallen Fascists. The top of the obelisk shows a lily and a star which are heraldic symbols of Pius VI. The Sallustian Obelisk (along with the Quirinal Obelisk and the Esquiline Obelisk) can be seen from the corner of the four fountains, at the intersection of Via 20 Settembre and Via delle Quattro Fontane. See all Sallustian Obelisk photos.